This patented innovative product has been locally designed to use an existing geyser (hot water boiler) to reduce your electricity bill by up to 40%. With electricity costs rising way above inflation, it will become an ever-bigger portion of the costs in running both the domestic and the commercial world. During the day, Photovoltaic panels are used to electronically heat the water up to 70 degrees celsius. By using a microprocessor-based controller, the controller can be set to optimise the geyser consumption depending on the consumer’s needs. During periods of low sun levels, normal utility power is used to ensure that the hot water is kept above 55 degrees celsius. The advantages of Geyserworx over conventional solar water systems and heat pumps is very predominant. This SANS 10400-AX2-compliant product can be configured to run multiple geysers, as well as a medium-sized commercial geyser, without the intrusion of an unsightly construction on your roof. Installation is a quick and easy process and takes no longer than half a day to install and to get the system up and running to maximum efficiency. Geyserworx has no moving parts to it, thus ensuring that there is no wear and tear. Due to the fact that an existing geyser can be used with this product, no modification has to be done to accommodate new plumbing. The Photovoltaic panels are guaranteed to last at least twenty years and there is no glycol or other heating medium involved that may contaminate water sources. As no batteries are required, there is no danger to humans or the environment. What makes conventional Photovoltaic systems affordable is the cost of the batteries. Further batteries need to be replaced and thus continuous cost of replacing the batteries. Therefore, this solution is cheaper as there is no maintenance. The installation is also more affordable as it doesn’t use the storage batteries like the conventional solar solutions (backup power comes through the mains). The “Deluxe” version comes with Wi-Fi and a phone app, and can be connected to the internet. By using the latest technologies, the app can be updated as and when new features are made available. 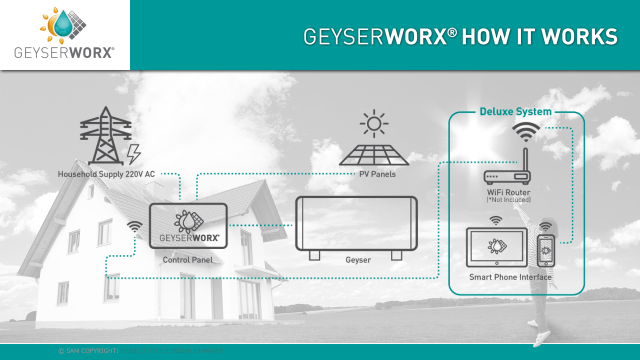 The Geyserworx Software Application allows the user to set the geyser’s water temperature, as well as switch the system onto manual mode to boost the temperature using ESKOM. Timers on the geyser can be set according to the consumer’s lifestyle to ensure that hot water is produced during times when it is required. The consumer can control and ensure that ESKOM power is not used during stipulated times. With “time of use billing” being introduced in the near future, the cost of electricity will be substantially higher during peak times of the day. Thus, one would want to ensure that ESKOM power is not used during these times. A “Holiday Mode” is provided to switch the complete system off when there is no activity in the home over a certain period. The system will automatically start up on time to ensure hot water is available when consumer’s return home. The software will further monitor drip tray leak detection, scale build-up on the heating element, if the element is faulty and will protect the original geyser from overheating and getting damaged. Save between 30 to 50% of your bill for approximately 10% of an “off-grid” Photovoltaic installation cost. As South Africa’s largest electrical and lighting distributor, Voltex supplies the widest range of electrical and related products through its 21 supply divisions and 59 distribution outlets strategically located across Southern Africa. Through this diverse network, Voltex services the agricultural, mining, manufacturing, construction, wholesale, electrical and communication sectors with a variety of products and services. These include, inter alia, energy efficient products, cable and wiring, power generation and optimisation, transmission and distribution, motor control solutions, commercial, industrial and residential lighting applications and a host of other highly specialised services.